Although Marcus Ericsson is keen to retain his Sauber seat for next season, that now depends on Ferrari and what they want. On Monday Sauber confirmed one of their two race seats, announcing that Raikkonen would be rejoining the team with whom he made his Formula 1 debut. The Finn entered talks with Sauber after learning at Monza that he would be losing his Ferrari race seat. As those talks were independent of Ferrari, it is now up to the Scuderia to decide Raikkonen’s 2019 team-mate. According to reports, the deal between Sauber, Ferrari and Alfa Romeo gives the Italian team the right to choose one Sauber driver. 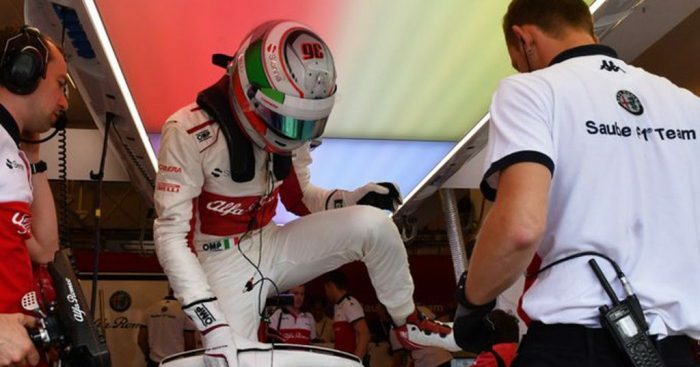 And that, the rumour mill claims, could be Giovinazzi. The Ferrari protege is in pole position for the seat, which would leave Ericsson, despite being backed by some of the same sponsors as the Sauber team, out in the cold. 24-year-old Giovinazzi contested two races for Sauber at the start of the 2017 season, replacing the injured Pascal Wehrlein. He was 12th in Australia but crashed out of the Chinese Grand Prix.